Coming May 17th from MVD, the first ever documentary on one of the most important musicians/artists of the past 40 years - Brian Eno. Best known as an early member of Roxy Music and as a producer for Coldplay and U2, Eno's influence over music as we now know it is incalculable. I first found out about Eno through his collaborations with David Bowie and from there delved into his solo albums. I was very excited to finally be able to learn more about this enigmatic genius courtesy of this DVD. I have been a fan of his music for more than half of my life and used to fall asleep to it every night (and still do on occassion). The Man Who Fell To Earth is an appropriate title for a Brian Eno documentary, mainly because he is such a unique artist who seems almost otherworldly. Starting out as musician with no formal training and unable to read sheet music, Eno manipulated instruments and recorders to make new sounds never heard before. After tensions arose between Roxy Music front man Bryan Ferry, Eno left to start his own solo career. After a pair of well received rock albums (Here Come the Warm Jets and Taking Tiger Mountain by Strategy), Eno released his masterpiece, Another Green World, which single handedly introduced Ambient music to the world. Eno continued by producing emerging avant garde groups and releasing a series of albums under his own vanity label Obscure Records (distributed by Island Records), further spreading this new sound to the public. Finally, David Bowie hired Eno to help him move towards the music Eno had already been creating on three of Bowie's best loved records (Low, "Heroes", and Lodger). 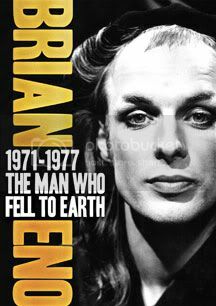 MVD should be applauded for releasing this well deserved documentary on the most important years of Brian Eno's career. At a whopping 154 minutes, this DVD collects lots and lots of rare performances, interviews and footage filmed in the studio showing Eno doing what he does best. Also included are interviews from several of his collaborators, friends and music journalists. No stone is left unturned here in this compelling look at how Eno came to be a purveyor of electronic music and an innovator in the recording studio, proving that you didn't have to be accomplished to make important and beautiful music.